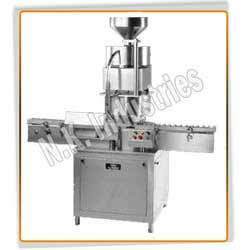 Multi Head Vial Cap Sealing Machine Is Designed To Apply Alu-and Flip-off Caps On Filled And Plugged Vials & They Comes In Configuration Like 4 Head , 6 Head, 8 Head To Match Output From 60 Bottle Per Minture To 300 Bottle Per Minture. A Special safety clutch device is incorporated on star wheel system for stoppage of machine in the event via gets overturned or in any jamming. Spring loaded free spinning sealing rollers eliminates any damage to aluminium caps and also allows greater flexibility of variation in the container neck diameter. Lowest particle generation. As an option, specially designed Viton sealing roller available. Specially developed Cam which apply steady pressure during sealing process thus result in to wrinkle free sealing & qualitative sealing operation. Quick & Very Easy Change Over and setting possible from one size of Container to another by a Single Ratchet spanner. Sealing Pressure can be varied to suit different gauges and sizes of aluminium caps. Gear box, Gear motor, AC drives & other electrical components are of CE Certified. Inbuilt Interlocks like No Seal in Chute, Machine Stops System & No bottle – No Cap system. Load the Sufficient caps in Vibratory Bowl. The Vials are received from in feed of conveyor and moved to feed worm assy. through the slat conveyor. Feed worm will create space between two vials, before it is moved in in-feed star wheel. Vibratory bowl feeds the cap into the cap chute continuously. If there is no sufficient caps in chute, NO-CAP sensor (Fiber optic Sensor) will give signal to control panel & Machine will Stop. Now, at In feed star vial index further, take a cap from chute and transfer to Six station Main turret wheel. Six Head capping head & Turret rotate clockwise, move down the cam operated capping head one by one with cap die, hold the vial with cap, rotate further and sealing chuck will make a thread on cap & seal it properly. After completion of cap sealing procedure at sixth station, capping head moves up and release the sealed vial. Now at out feed star plate, neat and cleaned capped vials will index further and transfer to discharge end of conveyor. Finally, vial moves to the other on-line connected machine through the conveyor. Totalizer (Counter) will give information of Total No. of capped/sealed vials.